(CNET) -- Months after teasing us at CES with an announcement of Skype's native VoIP client for the iPhone, the free Skype for iPhone will finally be available to download from the iTunes App Store sometime on Tuesday. 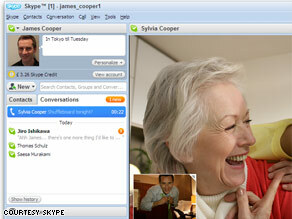 A new application will allow Internet chatting via Skype on Apple's iPhones. We got a chance to sit down with the application's principal engineer before the announcement was made at CTIA 2009, to see Skype for iPhone do its thing. While most of the features aren't too surprising--Skype does want to maintain some consistency across its mobile applications, after all--there are a few capabilities that are notably missing, and a few iPhone-only perks that are refreshing to see. In terms of navigation, Skype's VoIP app for iPhone looks more like your traditional iPhone app than it does Skype 4.0 for Windows. For many who already prefer Apple's sleek interface archetype, that's a triumph, but those who enjoy Skype's branding may feel disappointed. Skype's screens are well organized and use the iPhone's ability to add filters, for instance, to sort your contacts alphabetically, or by who's online. There's chatting as well, though Skype's flagship feature is its VoIP calling that's free to other Skype users and an inexpensive per-minute fee to landlines. Calls on Skype for iPhone work only if you're in range of a Wi-Fi network, so your call quality will in part be at the mercy and strength of wireless networks nearby--calls will not work over the cell phone network on the iPhone (but chatting will). Assuming your connection is solid, you can dial a number or quickly call a contacts stored in your address book. iPod Touch users will need earphones with an embedded mic to talk. During a call, you can mute the line, go on hold, or put the call on speakerphone. In the My Info window, you can follow a link to buy more SkypeOut credit online. Taking a photo from within Skype to serve as your avatar image, or pulling a picture in from the camera roll are two iPhone-only features that makes use of the phone's hardware attributes. Another imperfect, but still neat, feature is the ability to accept incoming conference calls. While you won't be able to initiate a call, we're told, you will be able to jump on one if a buddy invites you in. We hope the next version includes placing conference calls from the iPhone. Skype left a few more skills out of its maiden iPhone voyage. SMS, setting up a conference calling group, purchasing SkypeOut credit directly, and being able to field a second incoming Skype call are a few. File transferring and getting Skype voicemail native on the phone are two more. We expect to see at least two of these added in the next version, but we'll hope for more. Here's the big question on our minds: will Skype's iPhone app replace competitors like Nimbuzz and Fring, which focus on cross-network IM but also include VoIP calls with Skype pals even though they've been available for the iPhone for months? Kurt Thywissen, the principal engineer for Skype for iPhone, thinks so. He says what the other apps use is a workaround that requires them to channel calls through a server and transcode audio, resulting in poorer-quality calls than Skype can do in its own app. He may be right, but those who IM more than they vocalize probably won't ditch the likes of Fring too soon. They might, however, let Skype handle the calls and let another app take care of the multinetwork chatting.